We’ve known for some time that there is a shortage of nurses in England. There’s nothing particularly new in that statement. It’s been said by us at the Fund, the Public Accounts Committee, Health Education England, and the Migration Advisory Committee. That’s one reason why the decision to scrap the NHS bursary scheme and require trainee nurses and other health care students to take out loans has polarised debate. On the one hand, the government argues that this will create an additional 10,000 university places by making it more financially rewarding for universities to provide places on nursing courses, ultimately significantly increasing the pool of qualified staff. On the other, critics say it will deter people – particularly mature students and those from disadvantaged backgrounds – from applying for nursing courses and will saddle nurses with debt. And this takes place within the context of a wider debate about student finance and calls for it to be reformed. So what effect has this had on the number of people training to be a nurse? Well, the number of applications for undergraduate nursing places in the UK has dropped dramatically this year: down 19 per cent from 2016. Two important caveats, though: first, student applications are down generally, one possible driver being not only that tuition fees are going to be higher this year but also the loans on them are going to be charged a higher rate of interest from September this year. Second, it’s not actually the number of applications this year that determines how many nurses we see graduate in 2020, it’s the number that get accepted and then manage to graduate. 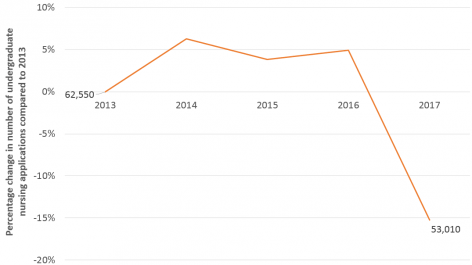 The number of applications accepted has been hovering at around 24,000 to 27,000 a year since 2010/11, which means that around 40,000 applications were being rejected every year. We can’t begin to assess the impact of the ending of the bursary on the number of students starting courses until later this year, when UCAS publish data on how many of those applications were successful. While this may reveal an increase in the number of places offered, there are already some causes for concern. First, if you break down those applications by age group, the number of applications from 19–34-year-olds, many of whom are likely to be in work and have family commitments, fell by 22 per cent last year, while the number of applicants aged over 35 dropped by a similar amount, down 23 per cent, reversing all the growth seen up until 2017 and leaving the overall number of applications from this age group lower than in 2013. Second, although the majority of applications for nursing places came from UK students (53,010), it is noticeable that the number of overseas applicants has also dropped. 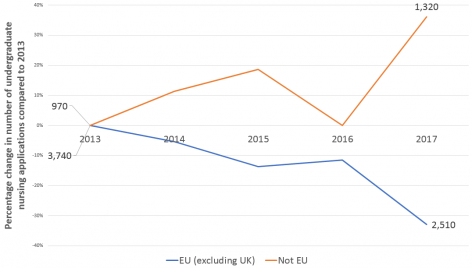 The increase in applications from outside the EU (up 350 to 1,320 in 2017) was swallowed up several times over by a reduction in applications from EU nationals (down 1,230 to 2,510 in 2017). Again, whether this actually translates to a fall in the number of nurses in training remains to be seen. Stepping away from the data on applications for a moment, there are unanswered questions about whether the number of clinical placements can or will be increased at the same rate as the number of places offered. Care providers across all settings are less able to provide extra training places than universities are to provide academic places. Teaching hospitals need to have staff able to oversee and assist trainees, not just provide them with clinical work. There may well be a gap between what universities would like to offer and what NHS providers feel can be offered with a safe level of oversight. In many ways, there’s nothing surprising in the figures we’ve seen from UCAS. It was entirely predictable that in the face of rising tuition fees and the removal of the nursing bursary we’d see a drop in the number of applications, particularly for people who aren’t coming into higher education direct from school. If you want to see how this might affect the number of nurses in training, Bolton University and Lancashire Teaching Hospitals, which moved to a fee-paying system in 2014, provides some indication of the possible impact. In June this year, their board papers show they’ve been able to double their number of placements to 120. However, over time the move to student loans may have other impacts on the nursing workforce. Will there be a change in the profile of the student population? Will having higher debts affect the future pay expectations of NHS staff? The answers to these questions and others will take much longer to emerge.